As their Global Action Theme, girls worldwide say: “Together we can change our world”. This theme is based on the Millennium Development Goals (MDG’s). An activity pack supports the curriculum and helps children and young women to learn about the MDG’s and, most importantly, to take action on the issues that affect them and their communities. The girls are encouraged to learn about the MDGs and, most importantly, take action on the issues that affect them and their communities. 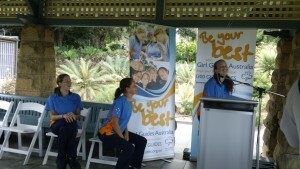 The Australian Guides Say…2010 Survey found that girls who are Guides have a keen awareness of global and local issues such as homelessness, poverty and environmental sustainability. The survey results, which were launched by Kate Ellis, the Federal Minister for the Status of Women, Mia Freedman and Girl Guides Australia’s Chief Commissioner Helen Geard found that there is a high level of awareness among Guides of the MDG’s. When asked about the (MDG’s) many people think of a sports stadium rather than 8 goals developed by the United Nations to combat extreme poverty. The high awareness of MDG’s among Girl Guides – 51% of those surveyed – is in stark contrast with that of the general public and will have a major impact once these girls and young women are take up leadership roles in society – which many do. In addition to conducting a regular survey on issues that matter to them, Girl Guides also embark on many more activities to fulfill their goal of “Enabling girls and young women to grow into confident, self-respecting, responsible community members”. For example, to expand the MDG work across Guiding and to take it to the broader community Girl Guides Australia organised the “Be the change” Roundtable, for which I received an invitation to facilitate. I had the opportunity to learn first hand about the Girl Guides’ pro-active stance on collaboration and leadership development at the roundtable. Girl Guides Australia has turned the third goal: “promote gender equality and empower women” into an action oriented slogan: “Girls worldwide say: Empowering Girls will Change the World” as part of their Global Action theme. The Be the Change Roundtable was driven by the success of a peer eduction project in the Philippines. The project saw young girls being educated by young girls on issues that weren’t adequately addressed elsewhere. It was conducted in “An environment that encouraged open to frank discussion without judgement, criticism or gossip.” This peer education project was perfectly aligned to one of the key goals of Girl Guides: to provide girls and young women with the knowledge and skills to make educated, positive life choices. The project will aim to deal with a variety of issues including self-image, depression and mental health, violence against young women, sexually transmitted infections and gender equality. All organisations welcomed the opportunity to contribute to a peer education program aligned with their own youth participation strategies. to build on their expertise and available resources. This is a most encouraging development and ought to be welcomed by funding agencies as an ideal channel for social investment. There is great interest among social profit organisations to pool resources to deliver the very best outcomes for the people for whom they share concern. This project is a great opportunity for businesses, trusts, foundations and governments to align themselves with a best practice initiative that with the benefit of collaboration has the potential to scale up rapidly. Here is the Girl Guide Australia launch video and for more on the ‘girl effect’ or why to invest in girls and young women click here. about the author: Ulrike Schuermann is an experienced international consultant & social profit coach. Her main areas of interest are social investments, income development for social profits; sustainable development and business and human rights. She regularly facilitates workshops for social profit organisations and corporations and can be contacted at enquiries@momentumpartnerships.com.